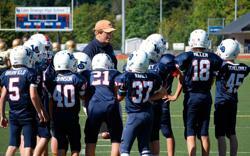 The Lake Oswego Youth Football Association has been a fixture in our community of Lake Oswego for several years and was incorporated in 1995 under Pop Warner. Lake Oswego Youth Football, Inc. now lives on as a non-profit organization dedicated to teaching the sport of tackle and flag football for the youth of our Lake Oswego Community and led by our head High School football coach, Steve Coury. LOYF players have achieved tremendous success over the years and the support and access that Coach Coury provides our youth program is unique and a great example of how a successful and integrated program should be run. Children play football because it is fun and they get to build tremendous bonds with their friends that start at a very young age…we have seen several of our Lakers "grow up" in the program to become tremendous leaders in our community and future high school football players as members of Laker Nation. LOYF also teaches key life lessons through the game of football including teamwork, work ethic, discipline, citizenship, integrity, accountability and mental toughness that they can carry on throughout life. Our board, coaches and assistant coaches all work to develop well-rounded individuals who are self-confident, self-reliant and begin to learn the many values and life lessons that can be experienced with the sport of football. LOYF is a member of the Tualatin Valley Youth Football League (www.tvyfl.com), which the second largest youth football associations in the country. The Tualatin Valley Football league is a flag and tackle-based football program for 1st graders thru 8th graders in the greater Tualatin Valley and Portland metropolitan area in Oregon as well as youth associations in Southwest Washington. With 38 football associations representing over 7,500 players and over 500 volunteer coaches, the TVYFL strives to create a unique and well-run organization providing a great, safe and enjoyable experience for all of the youth football players involved at the various associations throughout our region. Good Sportsmanship, individual growth and having fun developing student-athletes are the primary goals of the TVYFL.